Treat yourself to a stay in one of the 7 individually decorated guestrooms, featuring private pools and LED televisions. Your pillowtop bed comes with down comforters and Egyptian cotton sheets. Rooms have private furnished balconies or patios. Kitchenettes are outfitted with refrigerators, stovetops, and espresso makers. Complimentary wireless Internet access keeps you connected, and cable programming is available for your entertainment. Take advantage of the villa's room service (during limited hours). Breakfast is available for a fee. With a stay at White Santorini Suites & SPA in Santorini, you'll be a 1-minute drive from Santorini Caldera and 5 minutes from Skaros Rock. 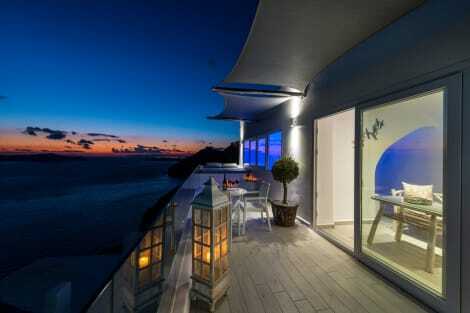 This 4-star hotel is 6.4 mi (10.4 km) from Athinios Port and 7.8 mi (12.5 km) from Kamari Beach. Make yourself at home in one of the 18 air-conditioned rooms featuring refrigerators and LCD televisions. Your Select Comfort bed comes with premium bedding, and all rooms are furnished with twin sofa beds. Rooms have private balconies or patios. Satellite programming and DVD players are provided for your entertainment, while complimentary wireless Internet access keeps you connected. Bathrooms have rainfall showerheads and designer toiletries. Take advantage of the villa's 24-hour room service. A complimentary full breakfast is served daily from 8 AM to noon.